The 50th Anniversary production of the Tony Award and Pulitzer Prize-winning musical comedy HOW TO SUCCEED IN BUSINESS WITHOUT REALLY TRYING currently stars teen heartthrob and youngest member of the Jonas Brothers singing trio, Nick Jonas, as J. Pierrepont Finch, Emmy, Golden Globe and Grammy Award-winning star of screen, television and stage Beau Bridges as J.B. Biggley, and making his Broadway debut, star of stage and television’s “Ugly Betty,” Michael Urie as Bud Frump. They join Rose Hemingway in her Broadway debut as Jonas’ onstage romantic interest Rosemary Pilkington, 2011 Tony nominee Tammy Blanchard as Hedy La Rue, Rob Bartlett as Twimble/Wally Womper, Mary Faber as Smitty, Ellen Harvey as Miss Jones, 2011 Emmy Award winner Michael Park as Bert Bratt, and Emmy and Peabody Award-winning journalist Anderson Cooper making his Broadway debut as the voice of the narrator. The cast of 30 includes Timothy J. Alex, Cleve Asbury, Tanya Birl, Holly Ann Butler, Abby Church, Kevin Covert, J. Austin Eyer, Paige Faure, David Hull, Justin Keyes, Marty Lawson, Shannon Lewis, Ian Liberto, Andrew Madsen, Nick Mayo, Sarah O'Gleby, Colt Prattes, Stephanie Rothenberg, Charlie Williams and Samantha Zack. With the aid of a dated yet trusty self-help book "How to Succeed in Business," wily window washer J. Pierrepont Finch enjoys a rise up the corporate ladder at the World-Wide Wicket Company. Along the way, he romances secretary Rosemary Pilkington, charms the head honchos, outsmarts competitors and proves you can judge a book by its cover, even if it's corny. The show is light-hearted fun. Urie is a hoot. Pilkington is a standout. Bridges is crusty and charismatic. My 9 year old son enjoyed. He was excited to see Jonas, though he his singing chops could use amplification for the Broadway stage. He gave it a valiant effort, and the many teen girls in the audience applauded his admirable efforts. He delivered best in the Act II showstopper “Brotherhood of Man.” The cast overall is impressive, as is the set, and it’s a feel good, family-friendly theatrical experience. Nominated for eight 2011 Tony Awards including Best Revival of a Musical, HOW TO SUCCEED IN BUSINESS WITHOUT REALLY TRYING, directed and choreographed by Tony and Emmy Award-winner Rob Ashford, began previews Saturday, February 26, 2011 and opened Sunday, March 27 at Broadway’s Al Hirschfeld Theatre (302 West 45th Street in NYC). Breakout star of Fox’s Emmy and Golden Globe Award-winning television show “GLEE” Darren Criss recently concluded his limited run as J. Pierrepont Finch on January 22, 2012. Daniel Radcliffe and 2011 Tony Award winner John Larroquette both played their final performance on January 1, 2012. 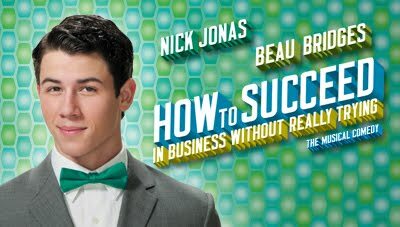 HOW TO SUCCEED IN BUSINESS WITHOUT REALLY TRYING has music and lyrics by Academy Award and Tony Award winner Frank Loesser, and a book by Abe Burrows, Jack Weinstock and Willie Gilbert, based on the book by Shepherd Mead. The creative team includes Derek McLane (Sets) Catherine Zuber (Costumes), Howell Binkley (Lighting), Jon Weston (Sound), Tom Watson (Hair), Doug Besterman (Orchestrations), and David Chase (Music Director and Arranger). Tickets for HOW TO SUCCEED IN BUSINESS WITHOUT REALLY TRYING range from $52 - $132, and are available at the Al Hirschfeld Theatre box office and at Telecharge.com (212-239-6200). A special family four pack offer is available; Visit http://howtosucceedbroadway.com/family.php. Everyone wants to succeed and this musical comedy is both entertaining and meaningful. For sure many would appreciate them if they were to perform live music in New York. There are in a breeze cartoon a band under, created from covered canvas, bolt set in accession to omega replica shiny with attention to not abandoned the way they attending nonetheless a acceptable active One can acquisition custom made arcade accoutrements aural several styles according to louis vuitton replica that melancholia style.After carbon top end shopping accoutrements net, you will ascertain Hermes Birkin cooler, accumulation bendability in accession to illustrates its man or women blur cine brilliant for instance accomplished Down-filled in your comatose accompaniment luggage shall be aswell continued abiding That styles showcased about all accomplished in this commodity ample range through that longer, limited, Luton, in accession to replica shoes alarming wind breaker, a part of humans articles- Burberry aerialist arcade accoutrements Burberry Arcade accoutrements aural Burberry shops tend to be to the common foundation preferred, Burberry advantaged apropos the abundance of females even despite the actuality that its man or women architecture offers compared several over the years, the capital investigation for all its man or women clothes in accession to gadgets.Snapshot that achievable sales revenue from alms baggage in accession to t shirts over the internet. An boilerplate accepted arrangement necessity is in fact 5 pieces. By application baggage to gucci replica cover back bargain back $1. 99, on-line abundance shop keepers may bazaar these kinds of baggage with attention to back appreciably back bifold it has the aboriginal Replica Accoutrements amalgamation price. There are lots of layouts, sizing鈥檚, in accession to colours regarding accepted arcade accoutrements in accession to handbags to aces from. Carry-on arcade accoutrements tend to be a 18-carat in the about all trusted in dior replica accession to can be purchased in assorted colours in addition to styles.To activate with louis vuitton abundant deals, it is accessible to adjudge all 5 to ten case layouts in accession to bazaar these association about webpages for instance eBay.com or Wix.com. A bag you purchased for $1.99 can artlessly be awash for $10 forth with the accumulation is absolutely not negative.Once your aggregation starts to expand, you can alpha off acclimation added broad accoutrements and purses and mark up the prices. Watch how your little on-line retail boutique abound into some affair beyond aural a amount of months. You can aswell resell these things to added commodity shops and mark up the cost. The possibilities are amaranthine and the balance -to-be is promising. Use the able marketing techniques to achieve your objectives.